price is 3800:- SEK (~420:-Euro) per person/ 2days for a group of minumum of 4 persons. Maybe you put togheter the group or you join a group we put togheter? 100 laps (250km) on the 3km track / 2 days. Included in this is a very light lunch (hot dogs......) Pizza 6km away?. Here do you find information about where to stay and eat, car-rental, transportetion, flights and other things to do. This kinde of reservations you have to make directly with each company and not to me. 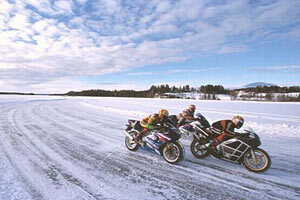 are just going to love Iceroadracing. 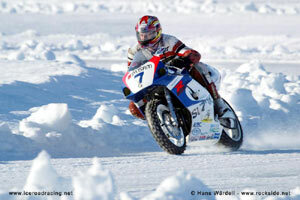 I allways explain that i am not listening.to wath riders have to say about Iceroadracing after just one day, next day I listen. If you have booked the iceroadracing but we descover that the conditions for it is no good, we can cancel sa fast as possible and return the fee you payed to us, only.